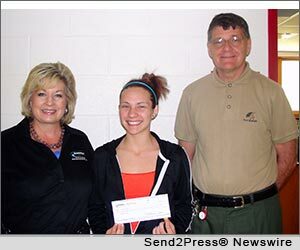 TIPP CITY, Ohio, June 20, 2013 (SEND2PRESS NEWSWIRE) — Energy Optimizers, USA is proud to present Jackson High School junior, Madison Hutchinson, with the 2013-2014 Youth Energy Leadership Award, a unique scholarship opportunity that is offered to promising students interested in pursuing post-secondary education in a STEM (Science, Technology, Education, and Mathematics) related field of study. With only one out of every five students having access to STEM-related extra-curricular activities, Smith saw the opportunity to provide students and teachers with funding and educational resources for STEM endeavors with a focus on green energy education and promoting energy conservation measures. These student-based groups called “Green Teams” are created in tandem with providing schools cost-saving, energy conservation projects implemented by Energy Optimizers, USA. The Jackson City Schools energy conservation project, implemented in 2012, included lighting retrofits, improved HVAC and temperature controls, and variable frequency drives, which has saved the district more than $166,000 in energy costs annually. The Youth Leadership Award, a $2,500 scholarship funded by Energy Optimizers, USA, was awarded to Hutchinson because of her exceptional academic performance, leadership abilities, commitment to helping her peers, and post-secondary interests. In addition to being a student council member and Regional Scholar, Hutchinson is also a participant in Jackson High School’s Green Team. Hutchinson and her peers have experienced great success, from hosting local energy fairs to creating recycling programs. Entering her senior year in the fall, Hutchinson already has plans to attend either Wright State University or Johns Hopkins University in 2015 to pursue a degree in pre-medicine. “We are thrilled to help cultivate the next generation of innovators,” states Smith, “I am eager to hear about Madison’s success at either of these esteemed universities and wish her only the best in her future career endeavors.” Hutchinson’s future goals prove that STEM education can help create industry leaders that touch people’s lives. Energy Optimizers, USA works with Ohio school districts and government agencies to implement energy savings opportunities to reduce operational costs, including lighting retrofits, renewable energy projects (wind and solar), HVAC retrofit projects, building automation retrofits and energy education programs. To learn more about Energy Optimizers, USA, visit their website at http://energyoptsusa.com or call them at (937) 877-1919.